Minting of Presidential $1 Coins have hit a new low, according to the latest production figures by the United States Mint. The series, which started in 2007 with over 340,000 George Washington Presidential coins, has experienced a production decline with each succeeding $1 release, with the exception of the Jackson dollar. Van Buren production is down by more than one-third compared to Washington dollar figures, as the following table reveals. A new multi-year coin series will almost always be the most popular during its launch year. Volume and interest should expect to decline as the series continues. However, these are not coins made for collectors, but intended for mass usage. Further, a 16.2 percent reduction compared to the previous Jackson $1 implies the Mint’s coin campaign to spur consumer use is hitting the expected roadblocks. Another explanation for the decline could stem from too many previous dollar coins minted, with those pulled from vaults and used in daily transactions. In this less likely scenario, public acceptance for the coins may be increasing. More time will tell where the series is truly heading. Although history of past $1 coin usage suggests a sheer vertical hill to climb while the dollar bill is around. More than 1.4 billion Presidential $1 coins have already minted since 2007. That is enough for every man, woman and child in America to own 4.6 of the dollars. Yet, few people ever receive one in change. 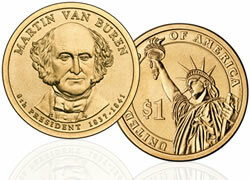 For the latest figures, visit US Mint Circulating $1 Coin Production Figures by President. Now that the edge lettering has been changed I do not intend to ever use any of the President Dollar coins. The Martin Van Buren coin was given to me as change in a store near where I live. I gave it right back. It does not have In God We Trust on it. I will refuse to use these coins and so will many others for that reason. so my dad just found one and we are wondering how much is it worth? I like using these coins, but old habits die hard. I doubt they will ever be common in circulation until we stop printing the paper ones. In the current economic climate, I am supprised that has not happened when you compare the cost of each over the long run. For those that say they are too bulky, compare to 4 quarters. I rairly find myself carying more than 5 paper ones. I’d rather have the coins in my pocket. No more wrestling with the vending machines that don’t like my old tatered paper either. (Phil Roberts just to let you it says In God We Trust on the edge of the coin.) how much are these coins worth because i have one. (martin van buren 8th president says pluribus unum in god we trust in the edge of the dollar coin) how is that dollar coin worth because i have 3. Unless it is graded high, pretty much the face value. The reason that I won’t use any Presidential coins is not where the motto In God We Trust but the fact that the Treasury did not stick to their guns and leave the series alone. They caved into the rediculous notion that In God We Trust was on the edge of the coins rather than the face. The only issue I could see was from a coin collecters viewpoint in that the edge can not be displayed in any way, shape or form. The design of this coin is rediculous. It is nearly the same size of a quarter, and sounds the same as well. One would have to take the time and ensure what type of coin you are handing to a clerk. The US Mint should make the US dollar coin distinct from other coins – like the UK does with the British Pound coin – thicker and heavier. Jim…the US dollar coin is gold in color..the quarter is silver….if you cant tell the difference then perhaps you need glasses. Kyle, the Martin Van Buren $1 Coin is worth $5. Names can be misleading sometimes. what if i have a martin van buren dollar that is silver. how much is that worth? Any offers on a foriegn US coin? how much is a 1737 and 1841 van buren dollar coin worth today? To me…… money is money. You use it or you don’t use it and then u just move on with the rest of your life. Miss Doo, if you would’ve examined the coin on the outer edges were it is usually rough on regular quarters, you would’ve noticed it says “In God we Trust” and it show the year it was made. Im sorry to burst in any bubbles, but in god we trust wasnt even added to the one dollar bill until 1957. There are many examples of things like this including the fact that “one nation under god” was not added to the pledge of allegiance until the late 50s. Once again, there are many examples of this. A little research easily reveals this. Anyway, this is not an attack on religion but I would like to say that to only use currency with “in god we trust” printed on currency is redundant, even somewhat counterproductive, because the reason this is on American currency is due to propaganda relative to the cold war and not in homage to Christianity. A dollar coin is worth a dollar. There you go, folks. Thank me later. Amazingly enough, I would think that the Martin Van Buren $1 coin would be the MOST sought after considering his relationship or lack thereof I should say, with King John Lackland of England (1199-1216). Martin Van Buren is the only president of the United States that is not blood related to King John and that INCLUDES Barack Obama through his mother, Ann Dunham.